Yes, thats right. 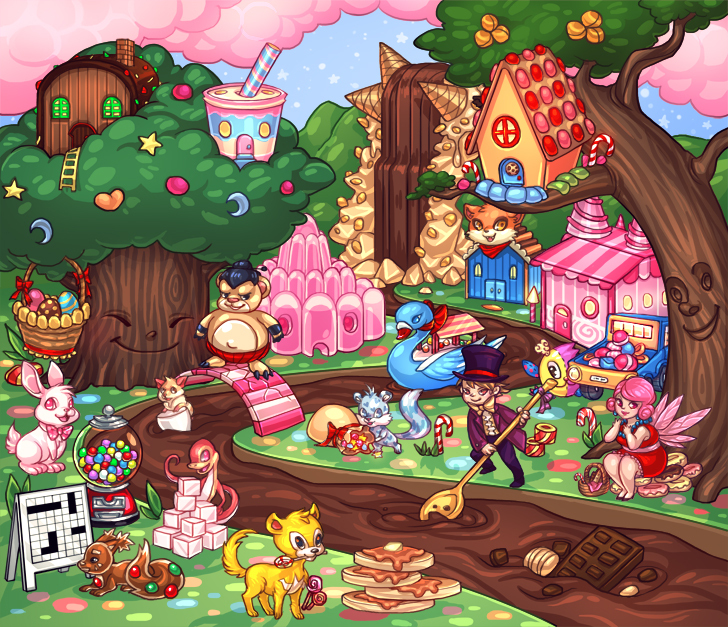 Candyland. A whole world made entirely from candy. Luckily there's no evil witches lurking inside the gingerbread cottage here, so you can bring your hungry pets there to eat if you can't afford to feed them. If you've got some MP to spend then you can browse the shops full of delicious sweet treats, or try your luck at the gumball machine. When your pets have eaten their fill they can sit in the shade of the candy tree while it challenges you to one of its quests. Visit the bakery to buy your baked items such a bread, doughnuts and cakes. Buy the candy items you want from the candy shop. Bring the Candy Tree the items he needs and he'll reward you for his quests. You can buy the gourmet cereal food you need from this cereal shop. Buy the chocolate items you need from the chocolate shop. There are two new crossword games to complete per month for a prize. The Easter Egg Hunt is an site event that takes place around Easter each year. The factory outlet store sells excess stock from shops at reduced prices. The Gingerbread House is where poor players take their pets to eat for free. A list of goals you can complete for prizes related to Candyland. For only 150MP you can use the Gumball Machine and see what prize you receive. Visit for 300MP once a day. Catch Gelatin asleep to win jelly prizes. Visit the Nutty Tree once every four hours and you may receive a prize. The Obese Fairy rewards you for feeding your pets rare, gourmet food items. Play every hour for 400MP. Match three pancakes in a row to win. Complete Sumo Sally quests by battling opponents in the battle arena. Play for 1,000MP. Knock over the stack and another player wins the jackpot.